All government offices in Jammu and Kashmir's Kargil were closed today as part of a shutdown call against the government's decision of creating a separate administrative division for Ladakh region with its headquarters in Leh. All political, social and religious groups of the region supported the bandh, and refused to be part of the newly created division unless there is a six-month rotation of the offices between Leh and Kargil. While Kargil observed a complete shutdown today, hundreds of people also went to Jammu region. Carrying national flags, protesters marched in Jammu demanding review of the decision. They have threatened the intensify their protest if the demand is not fulfilled. Residents in Kargil said normal life was affected due to the shutdown. All shops, banks and government offices in Kargil were closed. Few vehicles were seen on the roads. 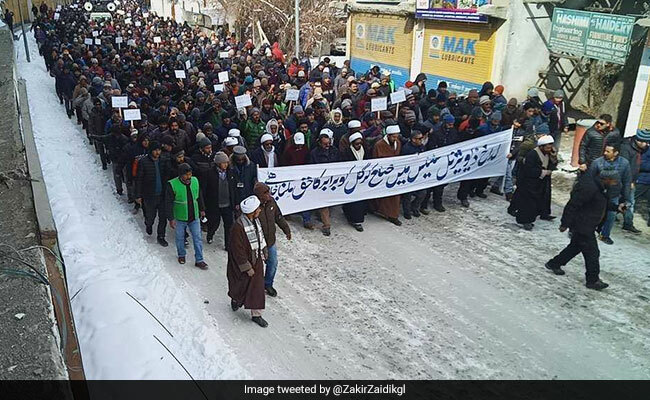 Braving bone-chilling cold, thousands had also marched on the streets of Kargil yesterday. "It was a decision in haste and we are protesting the way Kargil has been discriminated against. It's unacceptable to have the divisional headquarters in Leh. If it's not reviewed, we will prefer to remain a part of Srinagar division," said Sajad Hussain, social activist from Kargil. Jammu and Kashmir is under President Rule's. The decision on separating Ladakh region from Kashmir division was taken less than a week after Prime Minister Narendra Modi visited Leh. BJP, which had won the Ladakh parliament seat in the 2014 elections, suffered huge reverses after its parliamentarian and several other senior leaders from Ladakh resigned from the party in November. The party is desperately trying to regain lost ground before the Lok Sabha elections and granting separate division to Ladakh is seen as an attempt towards that. While the decision was welcomed in Leh, the party is facing a revolt in Kargil. The entire unit of the BJP in Kargil district threatened to resign if the decision was not reviewed. It may cause more trouble for the BJP after it led to demand for separate divisions in Pirpanjal and Chenab Valley regions.